This unit utilises HDBaseT technology to facilitate HDMI distribution of 4 source devices to 4 displays (4 in 4 out) in any combination. Supports transmission distance of up to 70m over a single network cable. Also features an integrated IR repeater system (Foxtel compatible). Allows transmission of audio and Video from your pay TV, CD, DVD, Blu-ray player, CCTV camera or almost any AV device wirelessly. Sends AV in one direction over an interference free 5.8GHz wireless link and provides a 434MHz return path for IR commands. This 5 Port HDMI Switch facilitates the connection of up to 5 devices to 1 HDMI input. The remote control allows convenient selection of the desired source device. This premium switch supports all HDMI version 2.0 features, including 4K Ultra HD, HDR, 1080p, 3D and more. The DS1 Desktop stands angle your computer speakers upwards, aiming the speakers' tweeters right at your ears. This allows you to really hear the higher frequencies, which are very directional. The DS1 speaker stands work best with small speakers like the A2+. The Audioengine DS2 Desktop Stands were designed to make the best of a desktop setting by first and foremost aiming the speakers higher. This brings the tweeters closer to ear level, and reinforces the frequencies that make up your music’s sound stage. The Audioengine S8 Subwoofer delivers great bass performance and provides low, tight, and smooth bass. Features include an 8" driver, a built-in power amp, dual analogue audio inputs, wireless ready, front-ported design and isolation elastomer feet. BenQ TH683 with Football mode is the all in one projector you need to enjoy home entertainment. Featuring Full HD resolution with 3200 ANSI lumens and 10000:1 contrast ratio. TH683 also offers multi display with an ultra smooth connection to ensure the highest image quality. To fully enjoy the beautiful game at football parties in a bright living room or backyard BBQ, a huge 100"+ projected 4K UHD 8.3 million pixel picture with vivid HDR colour in any lighting can't be beat. And custom Football & Sport modes with powerful sound put you in the action. BenQ W1700 4K HDR CineHome Projector with CinematicColour™ technology expands the thrill of giant screen visuals in your living room. Gather your friends and family in front of the stunning 4K HDR images with immense video and resounding audio enhancement. W2000 takes home cinema to a new level thanks to BenQ technology that achieves the Rec. 709 standard for HD colour reproduction. W2000 is precisely calibrated for cinematic colour, utilising a 6X RGBRGB colour wheel with precision tuned coating and colour segments. The Brik Audio AP-24H Headphone Amplifier supports up to 24bit/192kHz audio and comes with multiple inputs such as USB 2.0, 3.5mm auxiliary and an RCA input. This high quality unit delivers performance that well exceeds its price point. The Cord Phono Stage will boost the signal from your turntable, allowing it to be played through any sound system equipped with analogue line inputs. Features gold plated RCA connectors, a machined aluminum front panel, sturdy construction and more. This compact USB powered DAC (Digital to Analogue Converter) features an integrated headphone amplifier to provide the ultimate in convenience and performance. Supports PCM digital audio input with sampling frequencies of 32kHz, 44.1kHz, 48kHz, 96kHz and 192kHz. 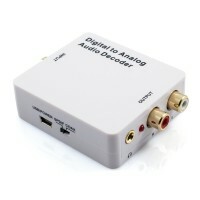 This Digital to Analog Audio Decoder converts Dolby Digital (AC3), DTS or LPCM to analogue audio. The left and right RCA and 3.5mm connections provide simultaneous output. For the ultimate in portability, this device can be powered via USB or mains power. Earthquake's new sleek and innovative CP8 subwoofer can do what others cannot. For a truly realistic earth shaking experience, this subwoofer can be placed under a bed, beneath a sofa or any other suitable location. Your imagination is the only limit. The new FF (front firing) line of subwoofers is the next evolutionary step in the continued quest for superb bass performance. The FF10 high performance subwoofer offers versatility, a small footprint and good looks all while staying surprisingly affordable. The new FF (front firing) line of subwoofers is the next evolutionary step in the continued quest for superb bass performance. The FF12 high performance subwoofer offers versatility, a small footprint and good looks all while staying surprisingly affordable. MiniMe is a stylish and ultra compact subwoofer with superb bass response. The powerful Class D amplifier coupled with the patented SLAPS (Symmetrically Loaded Audio Passive System) technology enables MiniMe to reproduce frequencies down to 20Hz. MiniMe is a stylish and ultra compact subwoofer with superb bass response. The powerful Class D amplifier coupled with the patented SLAPS (Symmetrically Loaded Audio Passive System) technology enables MiniMe to reproduce frequencies down to 18Hz. High power. Deep impact. Special refinement. Attention to detail. The MiniMe subwoofers deliver it all. The MiniMe P8W V2 subwoofer utilises an advance 320W digital class "D" amplifier, an 8 inch premium long throw driver and an 8 inch passive radiator with patented SLAPS. The newly developed RBS-52 passive studio monitor from Earthquake Sound is designed to be as versatile as it is technical and beautiful. Perfect for a home theatre set up or a musical studio, the RBS-52 was engineered to maintain high fidelity sound in a compact enclosure. The Supernova MKVI epitomises state-of-the-art subwoofer design. The MKVI series offers uncompromised performance and superior technology coupled with the world's most refined low frequency response. The MKVI defines a new standard in a class of its own. If you're designing a home cimena and have decided on an in wall speaker solution, you have come to the realisation that there are not many options to conceal a subwoofer effectively. The solution is here with Earthquake's Thor In Wall Subwoofer. Titan Hestia is a high-end multi-purpose LCR on-wall speaker. Designed to perfectly compliment the Telesto and Tigris floor standing speakers. The Hestia is capable of thundering dynamics while remaining perfectly composed, detailed and harmonic. The new XJ-300ST amplifier packs more power and flexibility than any other amplifier. No amplification task is beyond its capability. With an unimposing miniature size and almost unreal amounts of cool running power, this advanced Class J amplifier is the installers go to dream. The XJ-700R is a high power monoblock subwoofer amplifier ideal for powering large subwoofers or tactile transducers. Featuring advanced Class J output technology, VE-TAT acceleration and MARS protection, all in a cool running fan free 1U package. The Edifier G4 gaming headset is built to ensure premium gaming performance. Some of the features include a built-in sound card with 7.1 audio, LED and metal mesh design, a USB Connection and a retractable, flexible boom microphone. Independent industrial designers, engineers and members of the trade media have given the e235 Luna E 2.1 Edifier speaker system the 2015 CES Innovation Awards Honouree. Its outstanding design and engineering have set it apart from competitors. Edifier has done it again. They have taken an already impeccable Bluetooth speaker and made it even more extraordinary. From the Luna the e25HD has more to offer and still features a stylish design, smooth curves and piano finish. A fantastic accent piece for any room. The versatile R1700BT Bluetooth bookshelf speakers will have you wanting to play every device off them. Plug in your gaming console, computer or TV for exceptional sound quality. Multifunctional excellence emanates from these Bluetooth bookshelf speakers.